In Oberstdorf, she took to the ice in a striking tuxedo costume for her Chaplin themed short. Taking advantage of the new rule allowing lyrics to be used for singles and pairs competitive routines, she embarked on the new season with Nat King Cole singing “Smile” and after delivering a near flawless skate (a bobble on a double axel aside), she was beaming. Her score of 66.72 points put her in the lead going into the free. 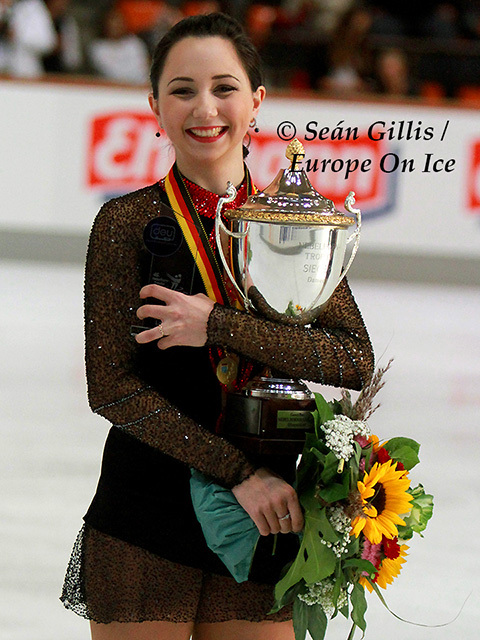 “There was a little mistake on the double axel, but overall I’m happy with what I did,” Leonova stated. Elizaveta Tuktamysheva had also been disappointed with her Olympic season. Touted as a strong contender for the Russian Olympic squad, she had crashed and burned at Russian Nationals in December 2013 and wound up in tenth place. Her season was over then and there would no Olympics for her. She wasn’t even on the original entry list for the Nebelhorn Trophy and only got the nod when Anna Pogorilaya pulled out to participate in the Japan Open. Tuktamysheva was ready to make the most of the chance she had been given. 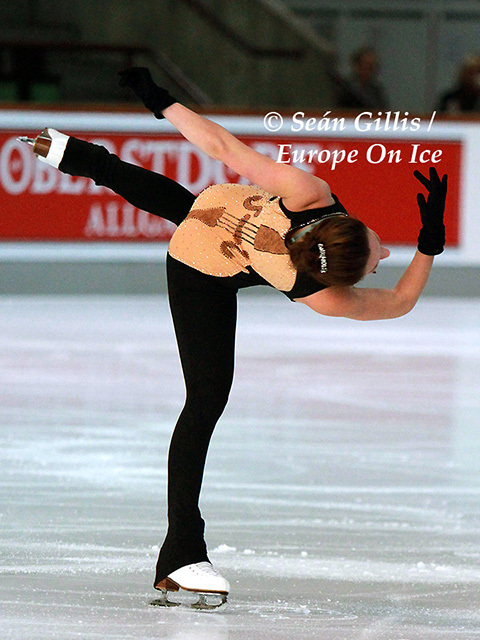 In what was almost an homage, she interpreted Ravel’s “Bolero” in a flirtatious manner that paid direct tribute to how Carolina Kostner had revived the piece for singles skating. Aside from an overturn on the second part of a triple toe loop/triple toe loop combination, her execution of her jumps, spins and footwork were near error-free and she earned the highest technical score of the segment which put her in second place on 64.94 points. Gold approached her opening element, but as soon as she went up in the air on that triple Lutz you could tell that it was not going to end well. Sure enough she slumped to the ice. While the rest of the routine went according to plan, she was now in third place on 61.82 points and playing catch up in the free. The medals would be decided amongst these three ladies. Leonova was first to skate in the free and she put out a decent performance with an under rotated triple toe loop on the back end of a triple flip the only major blot on her copybook. Her tango routine gave her a free score of 119.99 for a total of 186.71 points. Gold skated right after the Russian and all was going well until just after half way during her “Phantom of the Opera” programme when she popped a triple Lutz into a single. She beat Leonova in the free by 0.5 of a point, but her combined score of 182.31 points would not be enough to overtake her. It would be silver at best for Gold. An opportunity had now fallen into Tuktamysheva’s lap, but she still needed to skate well which was something she really hadn’t done since winning the free at the 2013 European Championships in Zagreb. She had opted for an Arabian theme for her free and it was a resounding success apart from a doubled triple flip. At the end of the programme, she pumped her fist in delight. She garnered a free score of 127.71 and a total of 192.65 points. 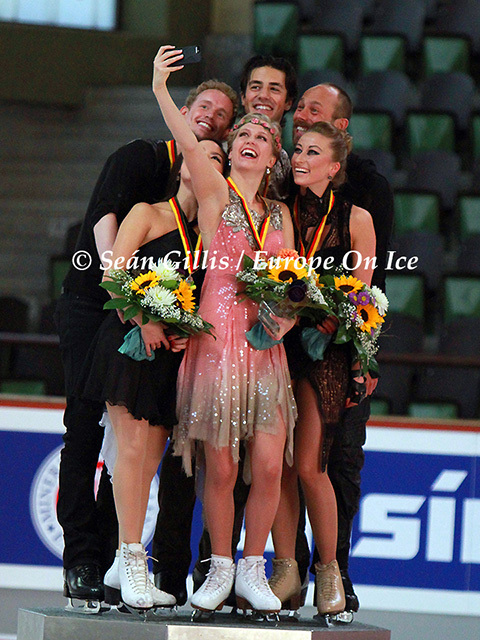 There would not be a happier winner at this year’s Nebelhorn Trophy. The judges, on the other hand, were not so happy with Julia Sauter from Romania who had appeared in the first warm-up group for the free with in a costume with a cello on her back. Unfortunately, the shape and colour of the instrument made it appear that she was mooning the audience and she was given a one point penalty. Even so she managed to pull herself up to eleventh overall. Ice dance both opened and closed the competition with the short on Thursday afternoon and the free on Saturday. It pitted World silver medallists Kaitlyn Weaver and Andrew Poje against Americans Madison Chock and Evan Bates. With Tessa Virtue and Scott Moir and Meryl Davis and Charlie White both on sabbatical this season, this would be the first time that the two teams would clash as the number ones in each of their respective countries. First up was the Paso Doble short. The Americans went and laid down a very respectable score of 62.80 points. They were immediately followed by the Canadians who were clearly superior on the programme components aspect. Weaver and Poje earned 65.59 points, although they fell victim to the ambiguous “violation of choreography restrictions” deduction. Eight out of the eleven teams in the short dance received this penalty which is used to designate either an incorrect pattern, too much separation, too long stopping or touching the ice with hands. It might be helpful to skaters, audience and media alike if what exactly was being penalised was made clearer. Nelli Zhiganshina and Alexander Gazsi inevitably did their own take on the Paso Doble with his costume consisting of a white vest and a pair of dark trousers, just as if he had walked off the set of a Marlon Brando film. The Germans, who train locally, found themselves in third on 58.67 points for their efforts. Two days later the teams were back on the ice to close the competition with the free dance. Weaver and Poje were the first of the top two to skate and performed a tentative rendition of their “Four Seasons” programme (which by design or coincidence did not include any selection from “Autumn/Fall”). The Canadians’ score of 99.73 was good, but beatable. Chock and Bates skated last to “An American in Paris” and with much more abandon and energy than the leaders cracked one hundred points in the free for the first time with a score of 100.93 points. However, it was not enough to overtake Weaver and Poje and the Americans in Oberstdorf ended up with a total of 163.73 points and second behind the Canadians on 165.32 points. Zhiganshina and Gazsi took the only medal for the hosts when they held on for bronze with their unconventional “Swan Lake Reloaded” choreographed by Stephane Lambiel. “I’m tired now,” Gazsi joked to everyone’s amusement. The men and ice dancers had been the subjects of a judging experiment. It involved the twelve person judging panel being assigned either solely technical elements or programme components to grade or a combination of both. There was definitely greater divergence on the components observed throughout the competition. Whether it will be adopted or not remains to be seen and no reports on its success or otherwise have yet been made by the ISU.